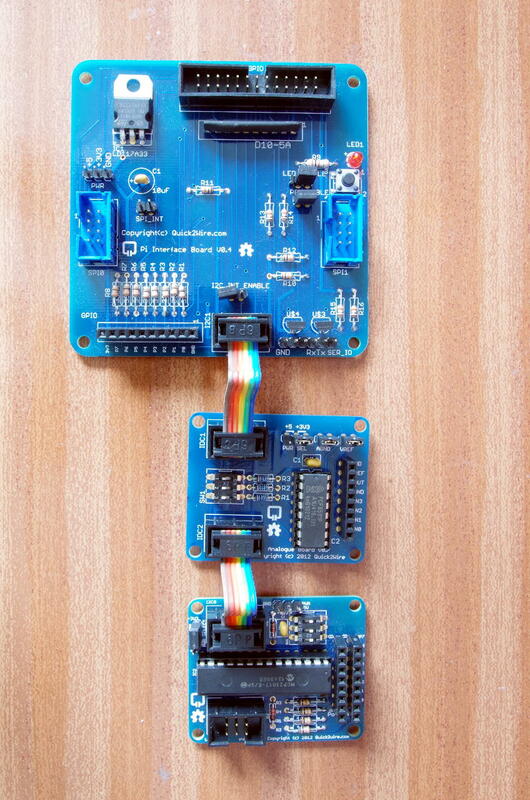 The Quick2Wire system is a series of hardware and software projects aimed at education and hobbyists, enabling easy general purpose interfacing with the Raspberry Pi. The system comprises a main board with on-board connections for the main 8 GPIO pins off the Raspberry Pi with access to the SPI, I2C and Serial interfaces via separate connectors. The main board has one LED and one button which can be jumpered in if required. It also features a separate 3.3v regulator to power all other SPI and I2C devices to take the load off the Raspberry Pi’s own 3.3v supply. It’s supplied in kit form, so you need to be handy with a soldering iron! These pages serve as a demonstration of using the Quick2Wire boards with the wiringPi library from the command-line, in BASH and C. There are several pages in this series and I hope they might act as a tutorial and possibly even an aid to making sure your Quick2wire boards are fully functional. The following pages will guide you through setting it up and programming it via the shell (BASH) and using wiringPi in simple C/C++ programs.